This halva recipe is our unheated version of the Middle Eastern dessert confection called halva, also spelled halvah. Typically made by blending a hot sugary syrup with nut butter or flour-based ingredients, halva is a rich, sweet and calorie abundant treat that you don't need much of to satisfy a sweet tooth. We always try to take traditional recipes like this one and transform them into healthier dessert variations, blending the best of both worlds: sensational taste as well as quality nutrition. To achieve this goal we like to use whole, raw unprocessed ingredients that are high in enzymes and nutrient content. Likewise, adding in different energy packed superfoods can dramatically change the way desserts make you feel AFTER you eat them. 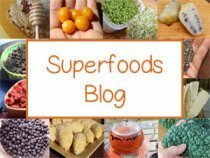 In this recipe we blend in some highly concentrated top superfoods including bee pollen, maca, ashwagandha, hemp seeds and a touch of shilajit. You can of course use other superfoods or add even nuts, like chopped pistachio, a customary nut used in many Middle Eastern halva's. 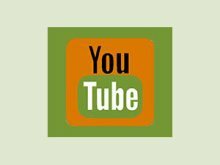 The ashwagandha powder and shilajit can additionally be replaced with any number of adaptogen tonics, medicinal mushroom extracts or even pine pollen powder. Most original old-style halvah recipes are essentially made in two different ways depending on the regional style. One uses flour as the base and the other is created using nut butter, commonly sesame tahini. Both of these types are made using toasted or heated flours, seeds, oils and always include a sweetener that is highly heat processed to produce a crystallized texture when blended with the other ingredients. 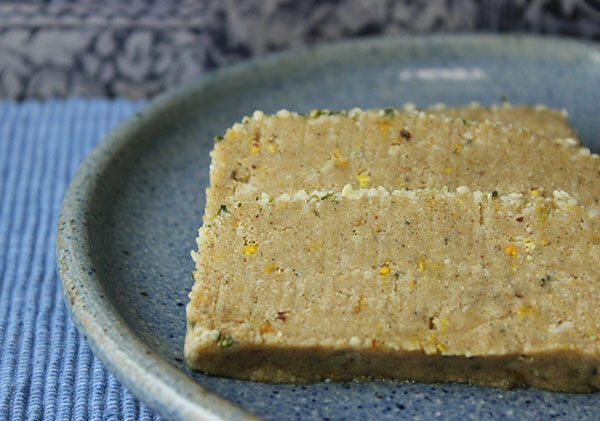 Sesame tahini halva's also commonly employ the use of egg whites for this same purpose. In this tahini halva recipe we skip all the pre-cooking and seed toasting. 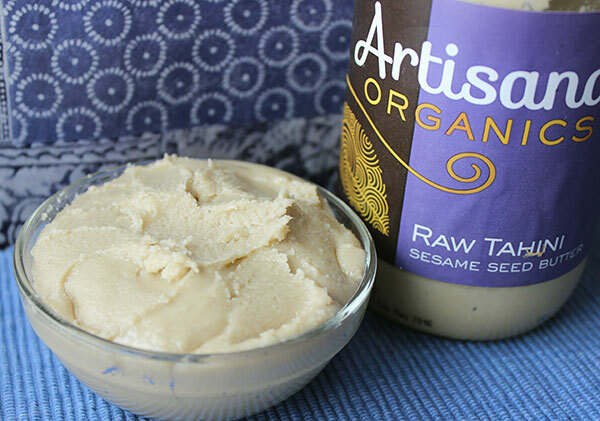 Ours uses one of the best raw organic tahini's available by the company Artisana Organics. It is untoasted, unlike many store bought tahini's, and is deliciously smooth and creamy, distinct from any we have experienced. As an alternative to using tahini, however, you may also want to make your halva from freshly ground, raw, organic sesame seeds using a food processor, grinder or high speed blender. 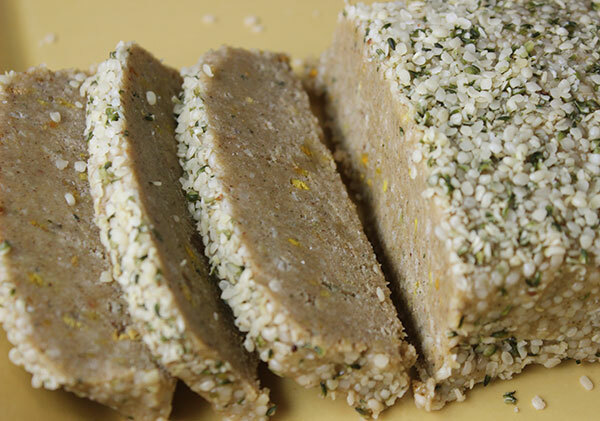 It is a bit less expensive to grind your own fresh rather than purchasing pre-made sesame seed butters. Homemade tahini's can be made from hulled, brown or black sesame seeds. Because no cooking is involved, this recipe is a very quick and easy dessert to make in usually less than 15-20 minutes. 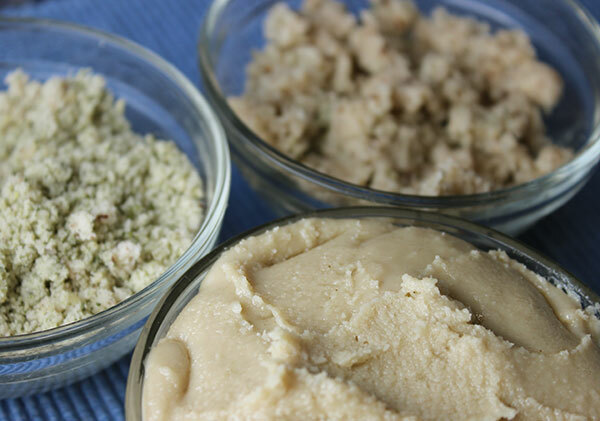 Once you have all the ingredients, its just a matter of grinding, mixing and forming your halva. The customary rectangular shape can be accomplished by using a mold or formed by hand via a straight edge kitchen tool. From here the halva will harden and can later be sliced. 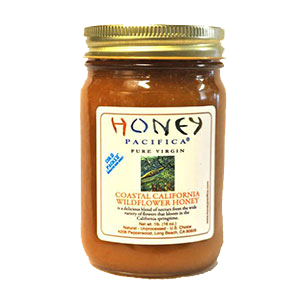 One of the best natural sweeteners to use in halva is raw honey. It creates the perfect consistency and firms up when chilled. 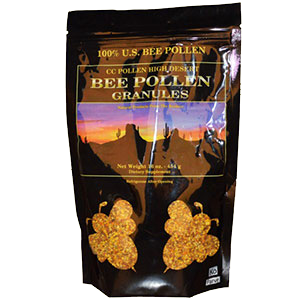 Both raw honey and bee pollen are additionally high in enzymes which help to digest the heavy dense nature of tahini. In most of our dessert recipes we also like to add a slight amount of green leaf stevia powder and use lesser quantities of the glycemic sweeteners. We use a little lucuma for the same reason and also for added flavor. 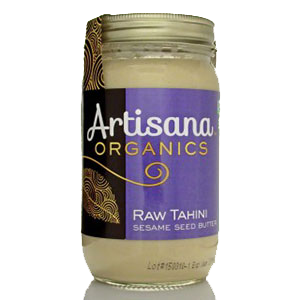 Tahini is especially known for its high amounts of calcium content and as well as omega fatty acids. The high oil content in sesame seeds, however, is mostly coming from omega-6 fatty acids rather than omega-3's. It is important to consume adequate proportions of omega-6 to omega-3 in the diet on a regular basis, in about a 4:1 ratio. 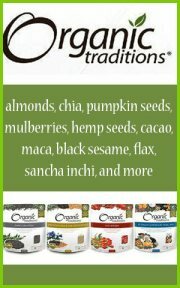 To increase the amount of omega-3's in this recipe we also include hemp seeds and hemp seed oil. The sesame oil in tahini also contains a high level of lignan antioxidants in the from of sesamin, sesamol, and sesamolin. 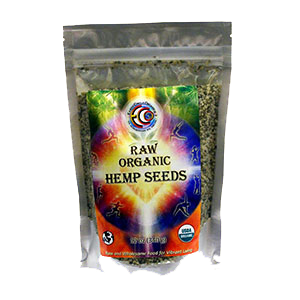 Grind the brazil nuts and hemp seeds into a fine nut meal and place in a bowl. Add all other dry ingredients and mix thoroughly. Mix in tahini, hemp seed oil and raw honey. You can mold the halva at this point or place in the freezer for 30 minutes to firm up slightly. Form evenly into a rectangular shape on a non-stick surface by hand or using a mold. 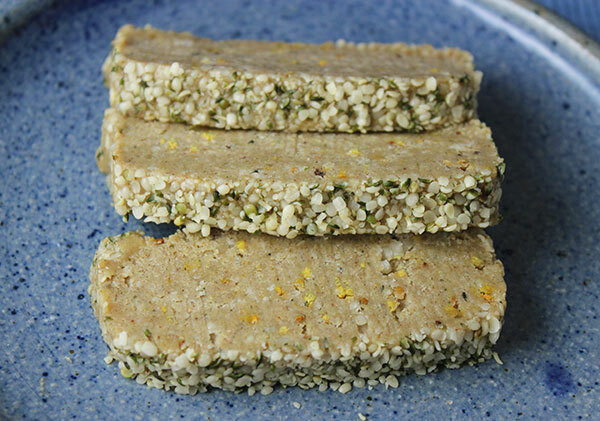 Layer the top with hemp seeds. Place in the freezer for 4-8 hours. 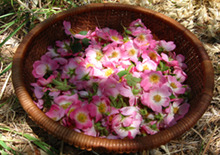 Decorate with assorted wild edible flowers, chopped nuts and seeds (or use black sesame). 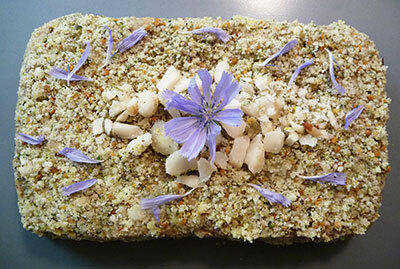 For more recipes and desserts visit our raw vegan recipes page.